Speculations about the next Pokémon game, and what it may entail, has been an intensive discussion for quite a while. Whether or not it will follow suit and be the third game to the 5th generation, "Pokémon Grey"; whether Game Freak will provide another spin-off; a remake of an older generation; or even the next-generation series altogether. Junichi Masuda had declared one day prior to the big news, that he would be making a "very important announcement" on the Japanese show Pokémon Smash, so what exactly would it be? None other than Pokémon Black and White 2! The third entry to the Black and White series had finally been revealed, yet not quite how we expected... Instead of one game, we have two to look forward to. The two titles will be released concurrently, for the Nintendo DS (it can be played in 2D on 3DS handhelds). However Japan can expect to see the two titles hit the shelves in June. The US site also names the titles "two incredible new adventures", which could indicate the the two games would actually be sequels to Pokémon Black and White, hand-in-hand with the titles "Pokémon Black 2" and "Pokémon White 2", it is very conceivable, bearing in mind it is not confirmed. The Official Japanese Pokémon website also revealed that "mysterious legendary Pokémon" will be starring in the new titles. 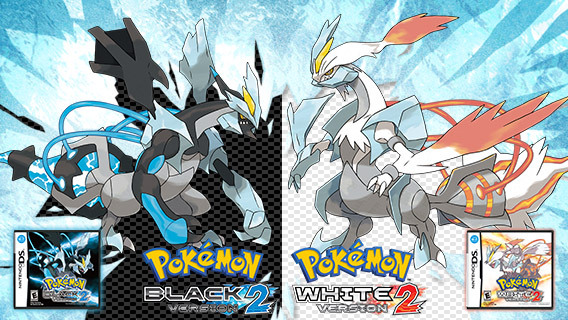 These, I imagine, would be the two Pokémon revealed on the poster, and whether or not they are related to Reshiram and Zekrom is also a possibility. But for now, all we can do is sit back and await further news concerning Pokémon Black and White 2, and what really is in store.